A conceptual rendering of upcoming streetscape improvements for Belleville's historic Front Street. 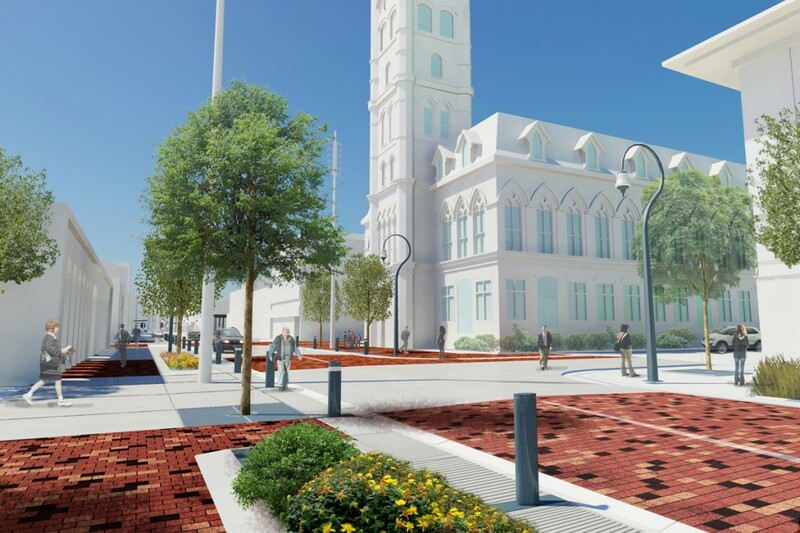 The City of Belleville has embarked on a forward-looking project to update the infrastructure of their historic downtown core. The project, which is upgrading and replacing both sub-surface utilities and the public infrastructure of the city’s downtown streets and open spaces, is designed to encourage private investments in downtown businesses, building renovations and new developments. BROWN+STOREY are working under the umbrella of Office for Responsive Environments to renew and create a higher quality public realm on Belleville’s Front Street and the adjacent stretches of McAnanny, Market, Campbell, Victoria and Bridge Streets, and to upgrade the visibility and usefulness of the downtown’s plentiful off-street laneways, parking areas, and the other connections that link city, hill and river. Construction will begin in 2015.